My afghan is coming along nicely! i have two panels of eight granny squares done. 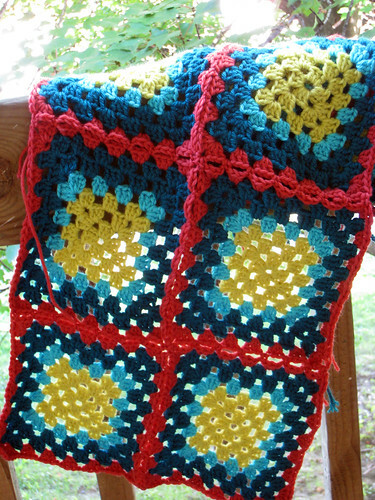 I'm using the leftover yarn from my coraline to join the squares, and I'm joining as I go... I really love this method, it makes it so much easier than I thought it would be! i think the colors are fabulous too! i need to restrain myself, i'm already thinking about what color i could do an edge in, but i think that might be overkill. 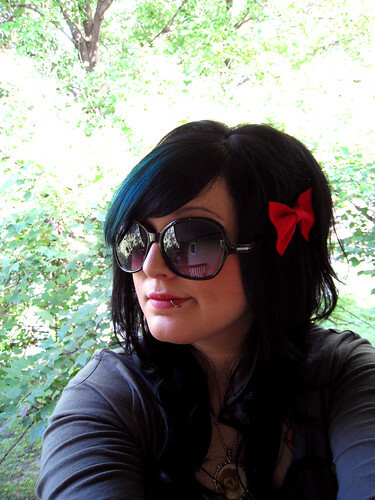 .... Raquel put a pretty teal panel in under my bangs! i told her i wanted to do a cool tone, and she picked the color out. i pretty much love it! it's the exact same color as the teal in my afghan! i made a new bow too, out of felt this time... it was really simple, and i really love the way it looks! it turned out pretty much perfect. i've been trying to make ribbon bows recently and i've been having trouble getting the shape right, but with the felt i got it right the very first time! annnd here's a silly photo of chris and i on our way out to a party! i love his new hat! I love the hair and the afghan! I've got a bag of granny squares that needs to be seamed, and I keep putting it off. I am definitely planning an edging, too, though! Sexalicious post. 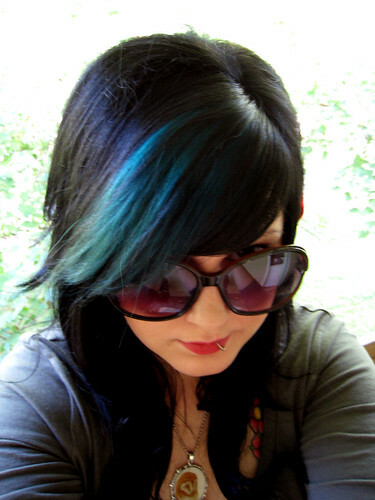 You're a babe with teal hair, I'm so jealous! you are too cute of course.